This game is for 2 players only. Scoff a limited number of divers and fish. The first player to reach their limit becomes the winner of the game. 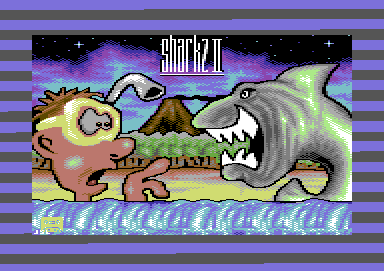 This is a sequel to the original Sharkz game. This time round, you race against time to eat as many fish and divers as you can. You can also hide behind the background as some food may be there. 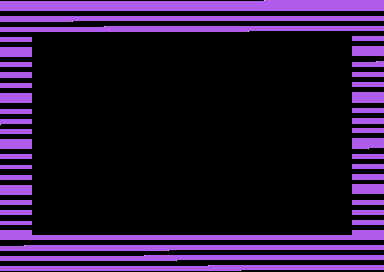 This is a fast paced horizontal scrolling challenge for two players only. 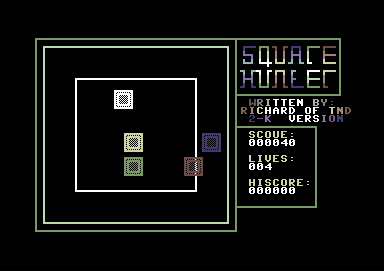 A spin off tribute to Jeff Minter's Laser Zone. 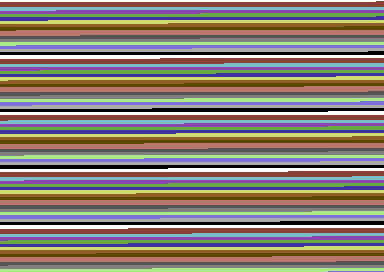 Two micro sheep have been transported into the neon Vortex, where each one is full of psychedelic invaders. 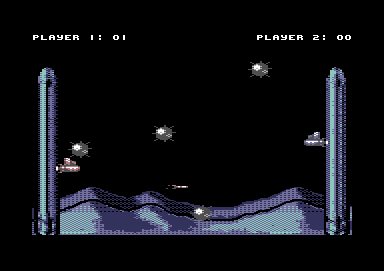 Your mission is to blast those invaders with your sheep, armed with laser beams (firing from their eyes) and clear each of the 24 vortexes. Watch out because if an invader captures you, your other sheep will engage a self-destruct mode and explode as well. Collect baby sheep (don't laser blaze them) for more points. Collecting sheep will also award you a sheep bomb. Unfortunately you are only allowed to use it once. 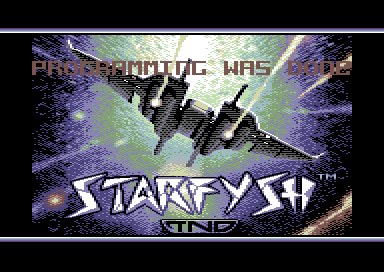 If you like this game and would like to buy the game on real C64 media, then please vist the web site, Psytronik Software for more information about this production. Your support is muchly greatful. 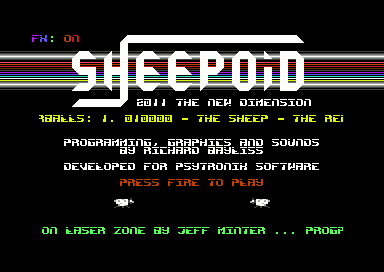 Please note that Sheepoid is a non-profit production, as you can also download the game for free on the the Psytronik Software website. 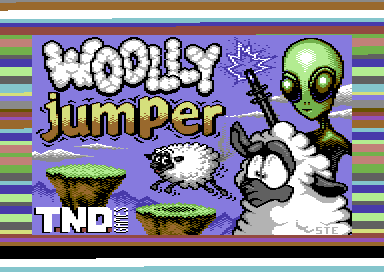 Woolly Jumper V5 now features a fixed jump, with huge thanks to Martin 'Wendt'. 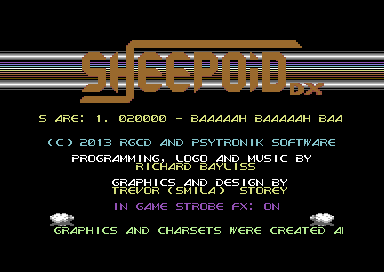 It doesn't feature on the downloadable version of the game, but it will be on the RGCD+Psytronik double pack (With Sheepoid DX). 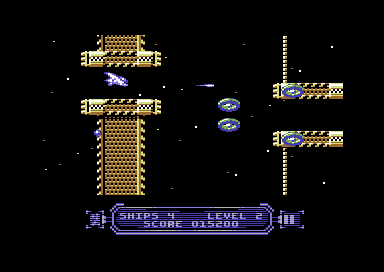 If you like this game and would like to buy the game on real C64 media, then please vist the web site, Psytronik Software for (Tape/Disk) or RGCD (Cartridge). Your support is muchly greatful. 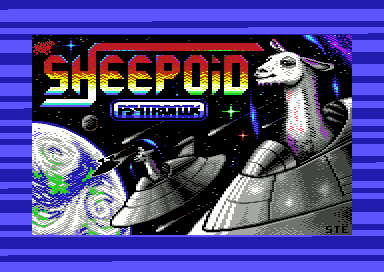 Please note that Sheepoid is a non-profit production, as you can also download the game for free on the the Psytronik Software website. 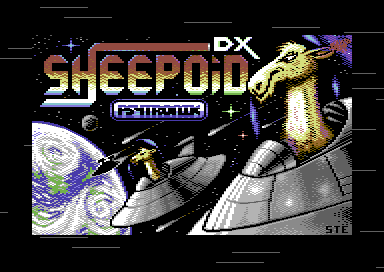 This is a 4 level preview of Sheepoid DX, as the full game will be released by RGCD on cartridge and PSYTRONIK SOFTWARE on disk/tape. 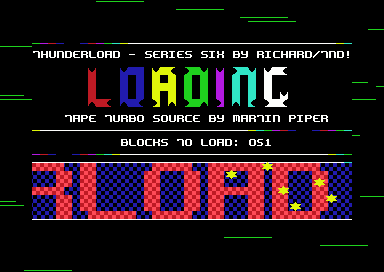 We will also be offering a FREE download of the full game a month after release (or possibly longer). Planet Earth is under threat from an alien mothership. The space goats are out to take over Earth. 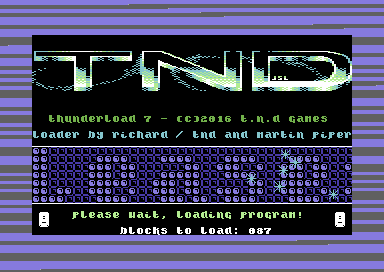 Two sheep have been transported into the neon vortex and is ready to save the world. 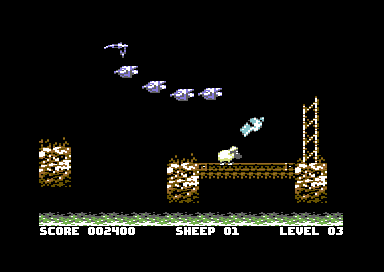 Using (or emulating) a joystick in port 2, you must control the sheep and blast at the aliens which approach the screen. 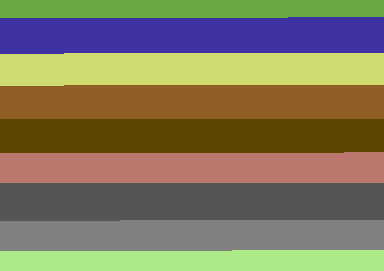 There are 4 levels in which you must fight through each zone. Collect baby sheep to gain sheep bombs (only one bomb can be carried). Pressing the SPACEBAR will activate the smart bomb. 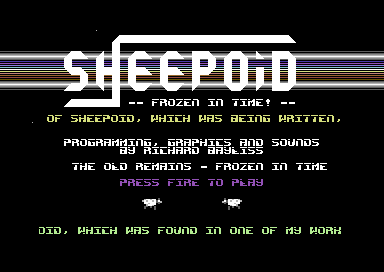 Good luck sheepoid. 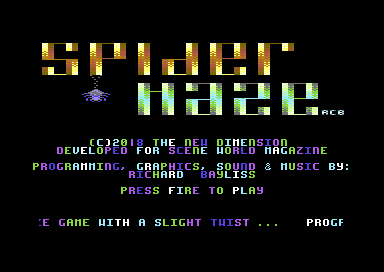 If you like this game and would like to buy the game on real C64 media, then please vist the web site, Psytronik Software for (Tape/Disk) or RGCD (Cartridge). Your support is muchly greatful. 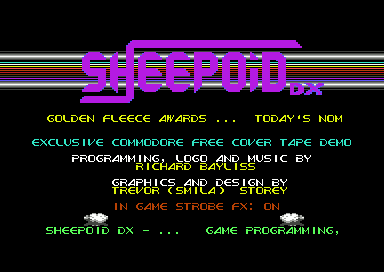 Please note that Sheepoid is a non-profit production, as you can also download the game for free on the the Psytronik Software website. 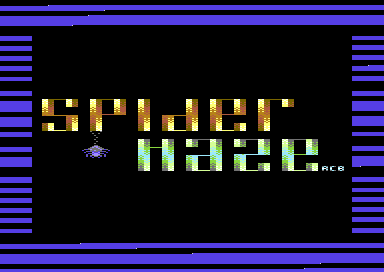 A spin off tribute to Jeff Minter's Laser Zone. 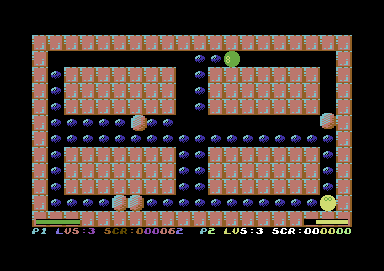 Two micro sheep have been transported into the neon Vortex, where each one is full of psychedelic invaders. 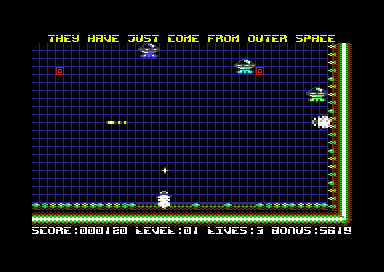 Your mission is to blast those invaders with your sheep, armed with laser beams (firing from their eyes) and clear each of the 24 vortexes. 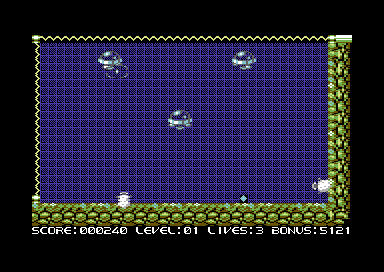 Watch out because if an invader captures you, your other sheep will engage a self-destruct mode and explode as well. Collect baby sheep (don't laser blaze them) for more points. Collecting sheep will also award you a sheep bomb. Unfortunately you are only allowed to use it once. If you blaze out a sheep, which you should rescue, 1,000 points will be lost. 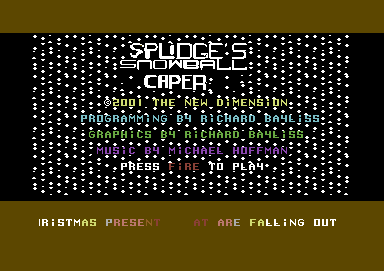 Can you complete all 24 levels of madcap mayhem. 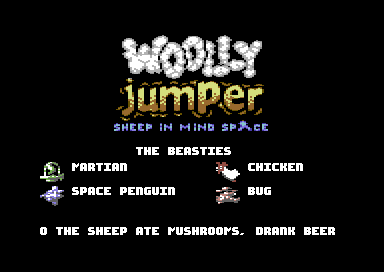 Disk version also comes with the latest version of Woolly Jumper. Control your droid up and down the screen, avoiding the security bots. Collect disks to disable a computer virus, which threatens to wipe out every machine in the world. Once all disks have been collected, you will move on to the next level. 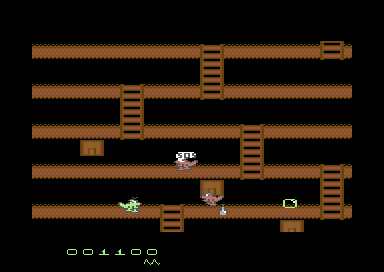 Help Sliggy rescue his mates from being trapped, avoid spikes and other baddies. You can fire bubbles at the bad guys. 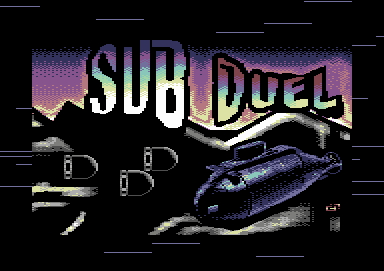 Control your ship and guide it safely around the deadly scrolling maze. After a short while, the map will eventually scroll faster, causing more harm to the player. Get through all the stages to win. 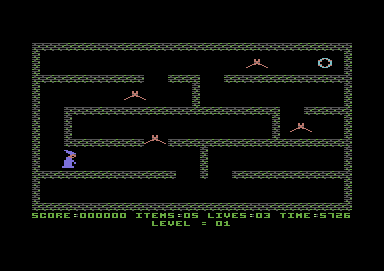 Instructions: You are trapped in the deadly dungeons of an evil warlock. You quest is to gather enough items and spells, before time runs out. Also you must watch out for those deadly vampire bats that want to bite you. One bite = a kill. Earth's Satellite Communications for broadcasting TV and Radio have been lost. It has been discovered that Earth's satellites, in deep space, have been ransacked by aliens from across the galaxy. The government tried to call in highly trained space cadets for a satelite repair mission. Unfortunately the cadets were just too lazy and stupid. Fortunately a mad scientist generated a new form of technology to help with the mission. Two CRUMPETS launched by a SUPER TOASTER. 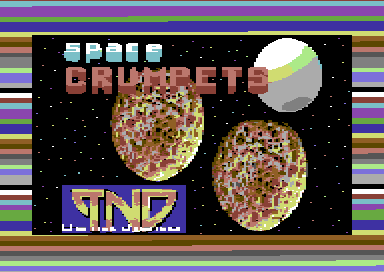 Behold - The SPACE CRUMPETS! Your mission is to guide one or two of the crumpets into four different zones, and repair satelites, by collecting flags. The aliens aren't all that happy, so it will be up to you to do battle against the aliens, and their guardians. Watch out for the deadly obstacles that occupy zones 2 through to zone 4. Collision with those will toast your crumpets. 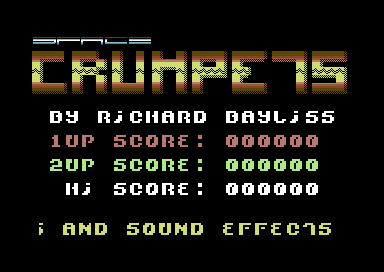 Good luck oh humble crumpet! 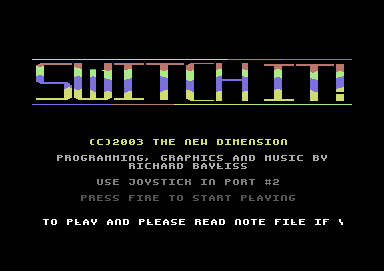 Using a joystick in port 2. Guide Splidge left & right, collecting falling presents. But avoid collision with those biblets that just want to cover you in snow. Crazy game. Sort of fun in some kind of way. Santa claus is flying across the screen dropping presents. This is a race for two players only to grab as many of those presents as possible. 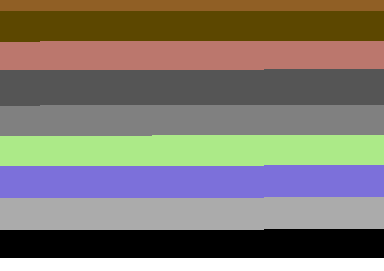 The first player to reach their quota wins the game. Watch out though because there are huge snowballs falling from the screen. If one of those hit you or your opponent, then it will freeze the player for a short period of time. Using the fire button will allow Splidge or his friend to jump. 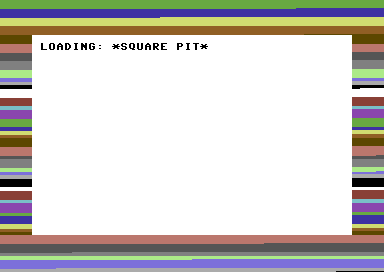 Move your square around the pit, collecting small white squares, but watch out for those other squares that don't match your colour. Guide your white Square around the inner pit, collect those small white squares to boost up your score, but watch out for the blue, red, green and yellow squares, which can cause you to lose lives. Once lives are all gone, the game is over. 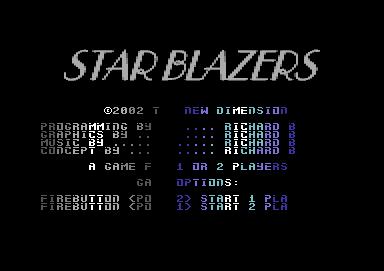 A game for 1 or 2 players. Blast the bouncing bubble to your opponent's goal within a certain amount of time. The winner is the player with the most points, after time has run out. 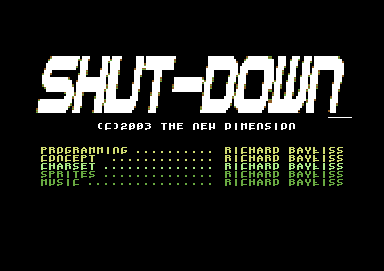 It is the year 2195. Planet Earth was severely damaged by intergalactic alien rebel forces. War raged over the galaxy. Earth remains inhabitable, not many people or animals survived, apart from a few. 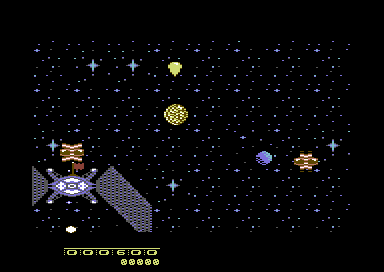 The human race and dog race were transported to the one of the RB2017 rescue space stations, which was later on attacked by the same alien rebel forces. Enter one brave commander to stop this atrocity. That is of course YOU. Guide your Starfysh across four zones and defend all of the rescue stations against the alien forces. Watch out as the aliens will fight back now and then. This is a special edition of Starfysh, I created for Reset issue 12. 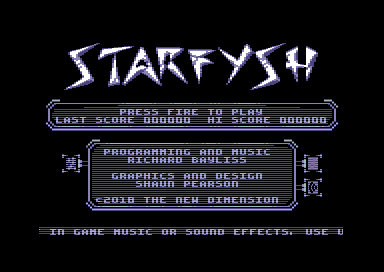 This is basically the original Starfysh, but with additional music, a multi-loader system (Due to memory restrictions where adding the music) and also an exclusive music demo. 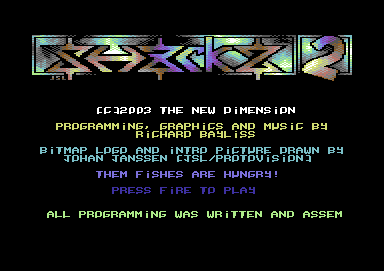 Load the main program up, and choose between the music demo or the game and enjoy. 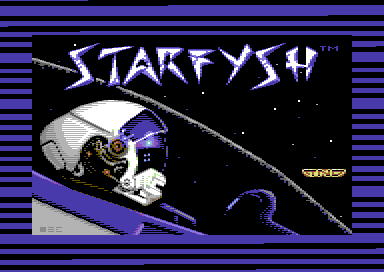 Guide your Starfysh across four zones and defend all of the rescue stations against the alien forces. Watch out as the aliens will fight back now and then. 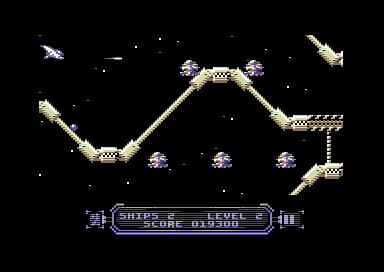 Avoid contact with aliens or scrolling background, otherwise you'll lose one of your shields. Lose all of your shields and it is GAME OVER. Good luck pilot! 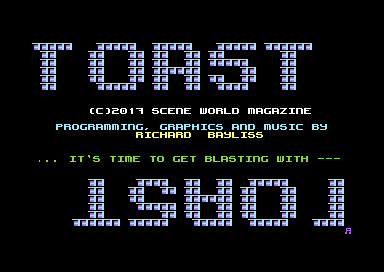 This is a simple score attack game, which relates to the Scene World issue 28 tutorial 'Let's Make A C64 Game' (Source code and full tutorial will be provided in issue 28 of Scene World as when it comes out). 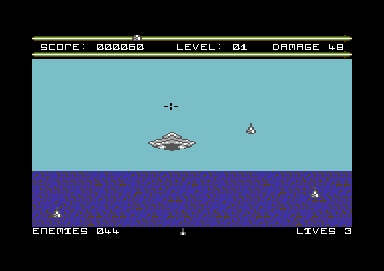 The object of this game is to fly your space cruiser through infinite space, and battle against hoards of aliens, scoring as many points as you possibly can. You have a limited number of lives, in which to gain as many points as you can. Should an alien shoot at you, or you crash into one, you will lose a life. All lives lost result to GAME OVER. 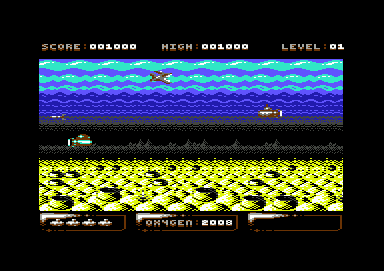 Guide your fighter plane across the ocean, zapping any targets that get in your way. Avoid collision with those nasty enemies. Or game is up!. 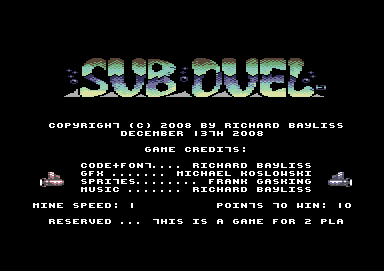 A game for 2 players only. Fight against your opponent, by blasting at mines towards them. The mines can also change direction after they hit the post. For additional digital downloads, tape/disk inlay, etc. 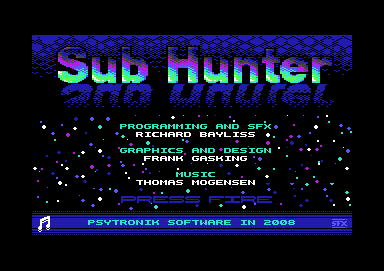 Please visit Psytronik's itch.io page. A nuclear disaster hit the ocean. 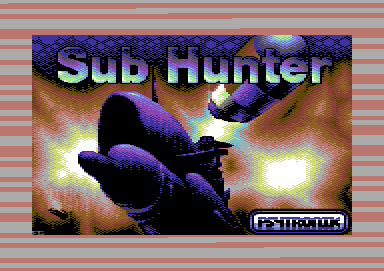 Now the ocean is guarded by agent subs and mutant fish and sea creatures. As a government agent, your mission is to clean out the disasters and save stranded swimmers before the fish and subs get them. 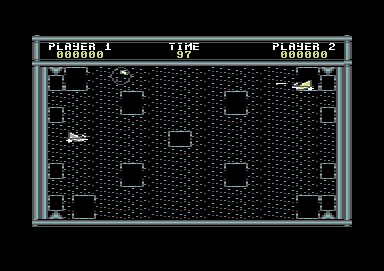 Also fight the mutant shark. 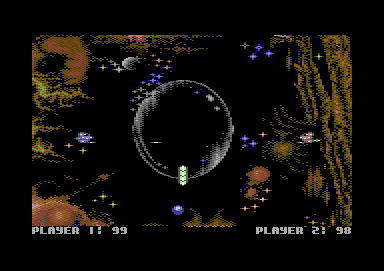 We also have included the Psytronik Demos disk with this game! 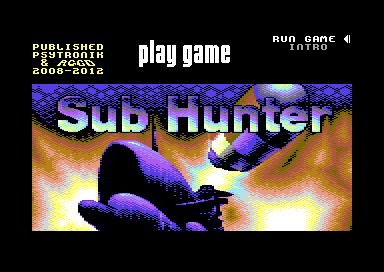 To mark the 10th anniversary since the release of Sub Hunter. 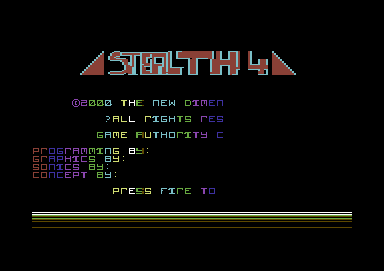 I am very pleased to bring you the 64KB cartridge build of this game. 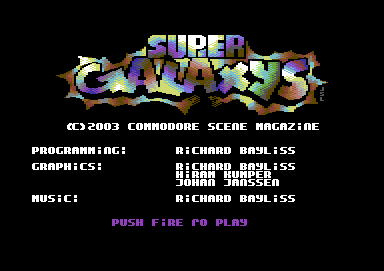 Credits have been updated slightly :) Please note that the cartridge version of this game was originally released in 2012. 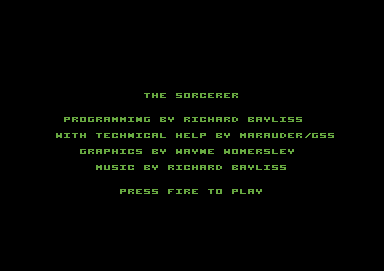 Additional credits have been added above. 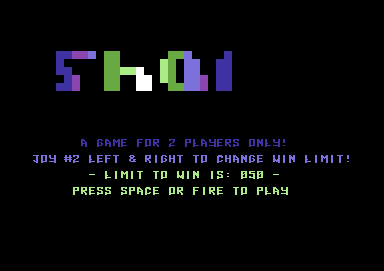 A game for 2 players only. Fight against your opponent, by blasting at them. Watch out for the deflector. Hit it and the bullet will reflect back on to your ship. The winner is the first player to drain all energy off their opponent. 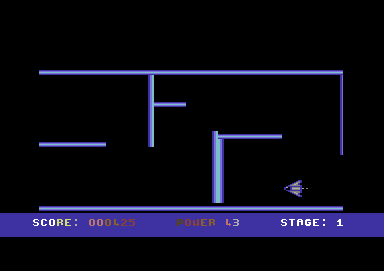 This was originally an unfinished game, which was released on to the Commodore Format cover tape, and was lacking a front end, and picture. In 2002, I asked the game's author if I could update his game by adding a front end and some other additional pieces of code. 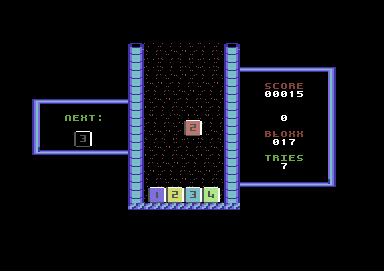 Although I was still sort of a beginner at programming in assembly language. The result turned out quite good at the end. 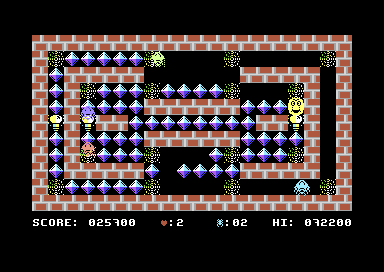 Play the role of a green or a yellow pac ball around the maze, chomping those blue pellets. There are also pellets of a different colour, which will enhance game play. Watch out for those boulders before they drain your energy and squash you. 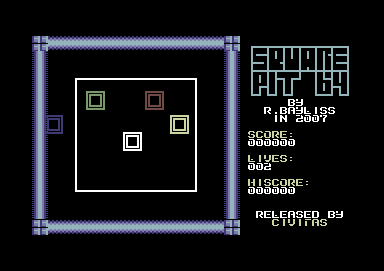 There are 100 (or maybe more) levels for you to pit you skills against before you are able to complete this game. 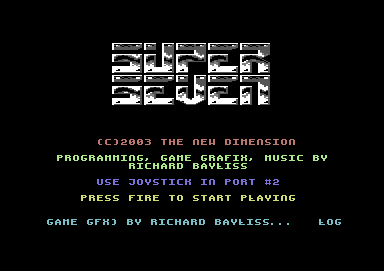 Graphics: Richard Bayliss, (Credit also goes to the scener which created the large font which has formed the Super Seven logo). The aim of this game is to drop a dice on top of one of the dices that is in the bottom of the container. 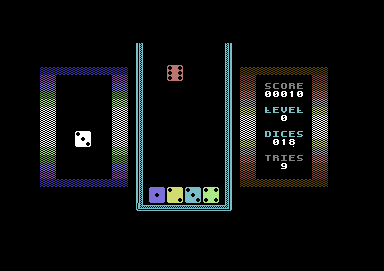 Each dice switches it's value, and your job is to simply match the value of your dice to one of the dices at the bottom of the screen. If you mess up, then a life will be lost. Once all lives are lost, it is game over. Simple gameplay, but rather boring I have to agree about. 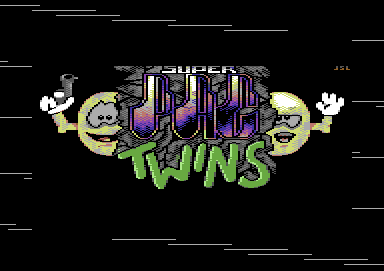 This is just an enhanced version of Super Seven, which I updated and released on to the Commodore Scene cover disk.